IPCC : Could Do Better ? Entropy versus Order – the central battle of the Universe. Also the struggle within the realm of Science, trying to make global sense out of a very disparate, creative spectrum of study on Climate Change. Here, at the very hub, we find the bubble of the Intergovernmental Panel on Climate Change, or IPCC – a wide variety of people with a wide variety of knowledge and viewpoints all trying to establish a common perspective. Continue reading IPCC : Could Do Better ? Posted on September 2, 2010 September 2, 2010 Author JoCategories Climate Change, Global Warming, Media, Science RulesTags Climate Change Science, Climate Science, Daily Express, Daily Mail, Daily Telegraph, George Monbiot, IAC, Inter-Academy Council, InterAcademy Council, Intergovernmental Panel on Climate Change, IPCC, Myles Allen, Rajendra Pachauri, Science, The Guardian, UNFCCC, United Nations, United Nations Framework Convention on Climate ChangeLeave a comment on IPCC : Could Do Better ? Who is meant by the ownership word “our” ? It cannot mean the whole of humanity, since there are still a large number of people who have no idea about the Science of Climate Change, or who deny it. I suspect that most Climate Change deniers would stop reading this report right there – as they don’t want to be included in the group of people who accept that Climate Change is real, happening and serious, too. Notice that there’s no question that the Climate is sensitive to Greenhouse Gas Emissions accumulating in the Atmosphere. There’s no “likelihood” associated with that statement. The problem with several Climate Change denier arguments is that they are “meta” arguments – philosophical arguments about how people behave, what they intend and how things are done. One such issue that they take is with the Intergovernmental Panel on Climate Change (IPCC) “consensus” method of operation. They seem to view the IPCC consensus as “blurred lines” – their conclusion is that the IPCC’s unified interpretation of the evidence is suspect. When the Police want to interview eye-witnesses, and when a judge wants to hear witness evidence, the standard practice is to keep the witnesses apart, so that the lines of evidence can be as independent as possible. By contrast, in Climate Change Science, there is a certain amount of collaboration between researchers during the course of their work, so you could say that no observations are made independently. However, this should not be labelled as “malicious collusion”, although many Climate Change deniers do do that. We shouldn’t have to keep restating the very obvious, but it appears that public understanding is very poor in some cases. Trouble is, there appears to be continuing interference in the patterns of thought of the decision-makers, from a range of sources, notably the mainstream media. Tune in to the facts. Banish the pacifying voices. We are at war with ourselves, and if we don’t stop burning fossil fuels, there will be an end to vast swathes of life on Earth. If the world stopped all unnecessary manufacture, production, power generation, transportation and building immediately, we could probably hold the fraction of Carbon Dioxide in the Atmosphere pretty much constant. Tom Wigley calculates that this “constant composition” or “CC” could lead to an eventual rise in temperatures, averaged, globally to over 1 degree Celsius. 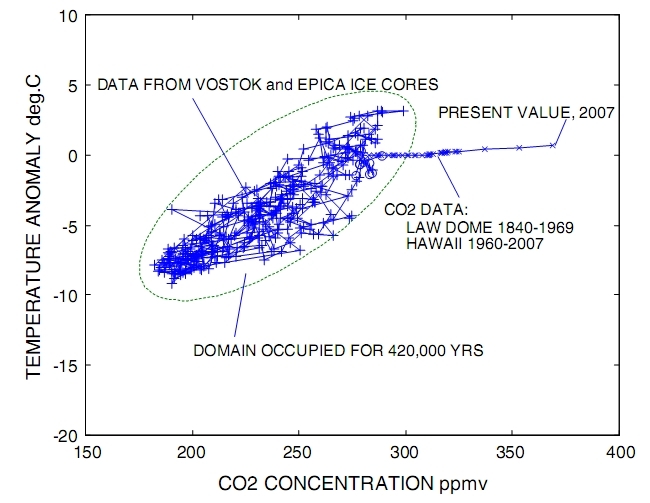 In the diagram above, I draw some simple lines and make some simple approximations of the integration of the area under the curve which represents the “added Carbon Dioxide burden” in the Atmosphere, and I arrive at a figure of 1.19 degrees Celsius. The question you should ask yourself is – what temperature rise are we going to see by 2070, given that Carbon Dioxide emissions are continuing at such a rate that Atmospheric Carbon Dioxide is still rising sharply ? A number of indignant inaccuracies and strident claims I will pass over, but here are a few I think I shall contest. Just to show that I do bother to read his work (even if I smirk about it most of the time). It should come as no surprise that the United Nations (under UNFCCC) commissioned a report from the Intergovernmental Panel on Climate Change (IPCC), way back in 2007. The revelation is that very few people appear to have read any of it. So I thought I would present just a little about the “robust findings” of Working Group 1 (WG1 or WGI) of the Fourth Assessment Report (AR4). I think the IPCC’s science needs a wider public readership, and so I hope that this post in some way enables that. The unpacking of the Working Group 1 report “Climate Change 2007 : The Physical Science Basis” could begin by looking at the Technical Summary, or the overall AR4 Technical Summary, or the Synthesis Report, or their respective Summaries for Policymakers. Why do people deny the facts coming from Scientists on Global Warming ? For this, Simon Lewis deserves a strong cup of herbal tea and several congratulatory back thumps, and a glorious badge of honour, which I shall personally craft myself from twigs, leaves and spiderwebbings. Please do watch Naomi Oreske’s magristral (not “magisterial”, since she’s female) presentation on her new publication “Merchants of Doubt: How a Handful of Scientists Obscured the Truth on Issues from Tobacco Smoke to Global Warming” in the YouTube above. The presentation is somewhat marred by poor audiovisual capture, but it’s fascinating, all the same, and good to hear her logical argumentation; and be reminded of what has been happening for the last 50 years in the public “debates” on Science. The Media have still not gotten to grips with what Science actually is, and how to present it, and how to research it, and often end up interviewing and reporting people who are either not expert in the field they are asked about, or have an underlying agenda for misinformation being published. Untidy Minds #6 : Mike Hulme ? Professor Mike Hulme has been the science chap the BBC nearly always call, of late, when they want to inject an alternate view into a piece on Climate Change. The author of the book “Why We Disagree About Climate Change” has been bravely trying to reframe Climate Change, not as a problem of science, but a problem of society. To some extent, I regard his work as useful. On the other hand, I find some of his work a mind trap. Continue reading Untidy Minds #6 : Mike Hulme ? Posted on December 6, 2009 December 7, 2009 Author JoCategories Bait & Switch, Climate Change, Media, Public RelationsTags AGW, Anthropogenic Global Warming, Climate Change, Climate Change Science, Climate Science, denial, denier, Global Warming, Global Warming Science, Global Warming Theory, Man-made Global Warming, Manmade Global Warming, sceptic, Science, skeptic2 Comments on Untidy Minds #6 : Mike Hulme ? My God made the World. From my point of view. From your point of view, your God (if you have a God), made the World. If you don’t believe in any Higher Power, then you make the World, as you learn about it and gain understanding. To be honest, he was taller than I expected, and more Eastern in appeareance, a kind of lanky version of Mehmet behind the deli counter at my local Turkish International Food Emporium. David Miliband was also considerably thinner than I would have liked, considering he might one day rule the New Labour Party, who might just rule my country again. We wouldn’t want him blown away by the slightest breeze, surely, would we ? He needs feeding in my opinion. Sometimes you can learn a snippet of useful information from television. It’s rare, and fleeting, but can have impact. 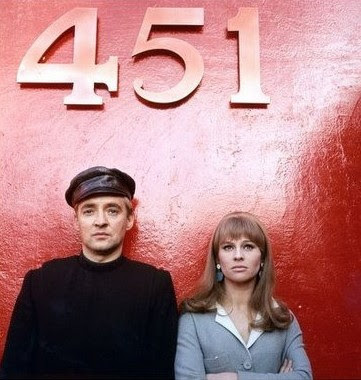 The other night on terror-vision, I watched the sumptuous Fahrenheit 451, a film made in 1966 by Francois Truffaut, based on the science fiction book by Ray Bradbury. I forget which channel it was on. Who cares ? All television is the same in the end. My attention has been turned, once more, to the writing of James Delingpole this week. This article, in my view, contains a number of pieces of misleading information, which in my view should be re-framed into their proper context by the author. Ah yes, time to pack up your trusty, dusty suitcase and head for the beach. I hope you’re not thinking of flying. Climate Change Denialists, or Sceptics (Skeptics) as they like to call themselves, will not be liking this piece of research one single teensy-eensy-weensy bit.